Cooking is a messy, delicious, sometimes time-consuming activity, especially when done with a little one. However, we at Witty World believe that it's never too early to start developing culinary skills, especially since cooking is a complete sensorial experience for children. 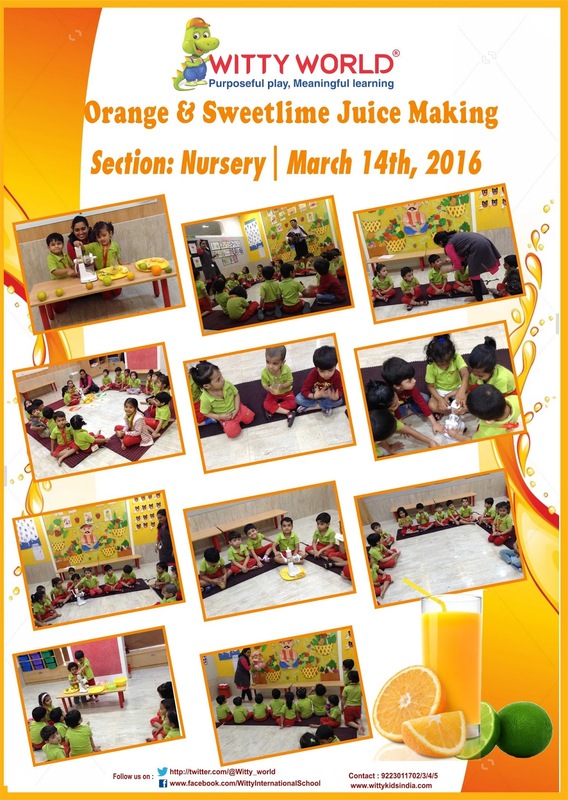 On March, 14th the little Wittians of Nursery made yummy Orange and Sweet lime juice. Children had already been informed to bring the necessary ingredients for the activity from their home. 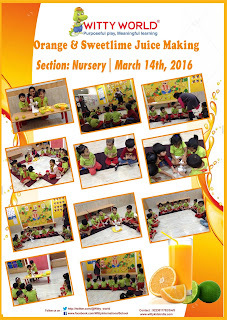 Children were provided with a small juicer, sweet lime and orange where children made juice by squeezing the orange and sweet lime with the help of the teacher. Later they enjoyed drinking a refreshing self made juice and even identified its taste. It was amazing to watch the little ones role play being chefs and making Juice with their teachers. What a yummilicious day for all!!! !